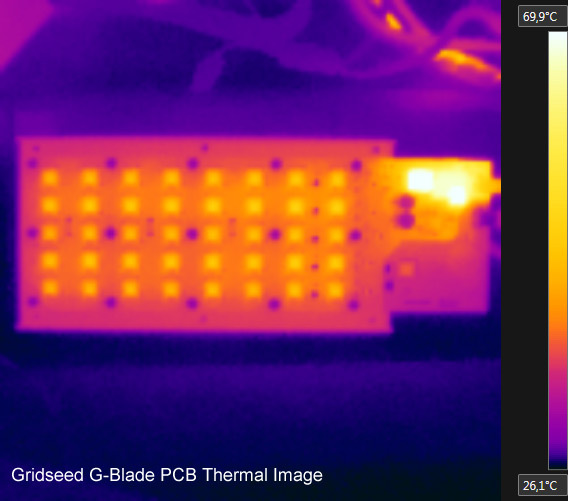 On the thermal image above you can see how things look on one of the PCBs of the new Gridseed G-Blade Scrypt ASIC in terms of temperature, the GC3355 chips of the device run pretty cool at about 40-50 degrees Celsius. 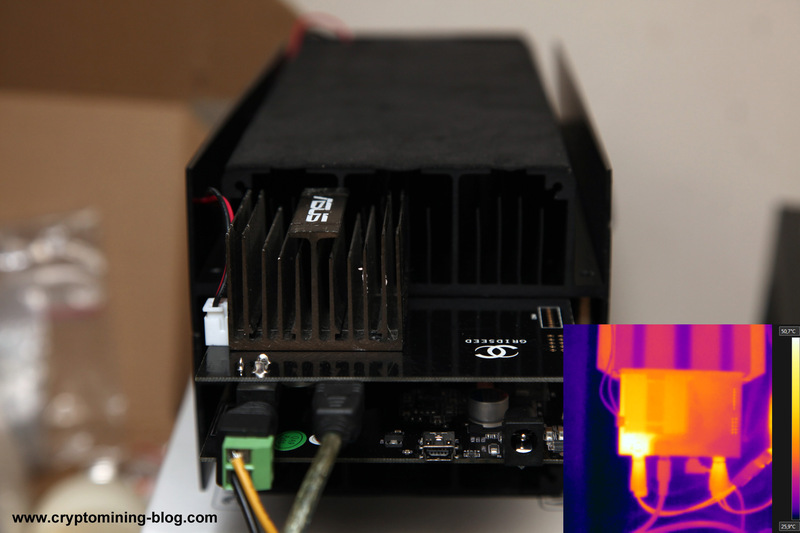 These are the thermal images of the voltmodded Gridseed G-Blade ASIC that we have posted about. 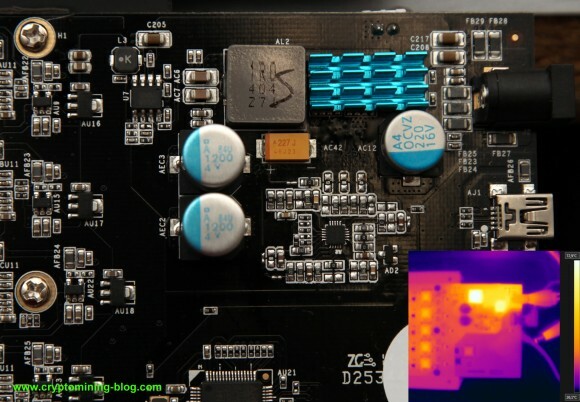 Do note that the thermal images are of the modified device with the additional cooling heat sinks attached to it, so the temperature of the voltage regulators is lower and the overall PCB temperature as well. You can use these if you plan on doing a voltage modification to your miners in order to see what are the possibly weaker spots – the components that get hot, in order to improve their cooling and to make sure that you will not overheat and burn your ASIC miner. We do recommend extreme caution when voltmodding the G-Blades as they are already pushed pretty close to their maximum by Gridseed and you do not have a lot of headroom for further gaining some extra performance. The power part of the Blade Miners is clearly not designed to handle much increase in the voltage, even though the GC3355 chips are just asking for more as we’ve seen with the smaller 5-chip ASIC devices from Gridseed. Take a look at how hot the PCB gets (around 50 degrees Celsius) near the power connector and that is with about 85W of power consumption per PCB, a clear sign that the connector used is not the perfect choice for powering the G-Blades and while with the stock setup it might be Ok, you should be careful when you voltmod. Do note that we already have a large motherboard chipset heat sink attached to that side of the PCB and it does lower the overall temperature as well. It is placed on the back side of the PCB where the voltage regulators are and it helps to reduce their temperature, because the airflow from the cooling fan does pass through it as well and helps to keep it quite cool. Looking at the side of the PCB where the voltage regulators are placed, thanks to the heat sink we have placed directly on the three VRMs their temperature is quite Ok, but there are other components that might have some issues with heat. These are the choke on the left of the voltage regulators on the photo and the 16V capacitor below the regulators as they both get to about 70 degrees Celsius in terms of temperature. And while they still do seem to work fine in the long run this may cause some issues, so you might consider replacing the capacitor with a more serious one. Again we are going to advise you to be very careful should you consider doing a voltage modification to the new Gridseed G-Blade miners as it can be dangerous and you can easily damage your expensive miner. The modification here is not as easy as just replacing one resistor as you need to do cooling improvements as well and you are not able to push things too much to be on the safe side, so the hashrate increase is also not that big as compared to what you are getting without the modification. So you might really want to reconsider if it is worth doing the modification at all, we are probably not going to be modding another G-Blade for a while until we see how the voltage mod will handle on the longer run in its current state. Seems the overclocked blades could benefit from some heatsinks on the choke and capacitor, as well as a good fan on the back side. Definitely need some active cooling on that back side. Like you said in the previous post, is it worth it? Maybe someone can figure out how to replace the choke and capacitor for cooler operation. Also, maybe a 35kOhm (~1.3V) resistor mod may have lower temps? 35-36 kOhm should make it easier for the power elements, though the advantage in terms of additional overclock will also be smaller, so something more like 900 MHz stable with low to no HW errors is probably to be expected. And the increase in terms of performance then will be even less worth the effort to actually perform the voltmod then. I’m not going to do the volt mode but I would like to know if it would be ok for me to use the new CPUMiner from sandor111 with the –gc3355-autotune flag on my new G-Blade without doing the Cooling mod? nose, without a voltmod it should be Ok, but just in case do not leave the miner unattended while the autotune finds the best frequencies.